Application Potential « Global Market Insights, Inc. Rising demand for food & beverages across the globe due to growing population along with improved consumer lifestyle in BRICS countries is expected to favorably affect xanthan gum market size over the coming years. Food & beverages sector contributed a revenue of USD 8.50 trillion in 2004, which exceeded USD 15 trillion in 2015. The product is extensively used in this sector due to its ability to enhance moisture retaining capacity and improve shelf life of baked items. 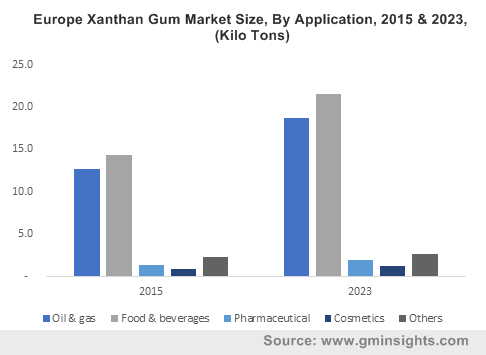 According to Global Market Insights, Inc., “Xanthan Gum Industry size is anticipated to reach USD 1.2 billion by 2023.” Xanthan Gum finds wide applications in cosmetic products such as lotions, denture cleaners, and shampoos due to its thickening & stabilizing property. Furthermore, FDA and USDA approval for the use of xanthan gum in bakery foods and medicines will provide huge growth opportunities for the industry over the coming years. European commission has also approved the use of xanthan gum as an emulsifier, gelling agent, thickener, and stabilizer in food & beverages sector. Oil & gas firms are actively involved in setting up enhanced oil recovery processes to increase the production of crude oil & natural gas from potentially exhausting reserves and this can boost the industry growth over the coming years. Crude oil output across the globe was 3950 kilotons in 2007 and reached 4130 million tons in 2015. Growing spending on production, exploration, and development of crude oil & gas in upstream segment have played a vital role in enhancing the crude oil production across the globe. Global upstream expenditure was worth USD 410 billion in 2009, and exceeded USD 660 billion in 2015. Furthermore, strategic initiatives such as new exploration licensing policy announced by the Indian government to encourage exploration and production activities in oil & gas sector, is projected to drive the industry trends over the coming years. Xanthan gum finds its applications in cosmetics, oil & gas, and pharmaceutical sector. Xanthan gum market revenue in oil & gas sector worth USD 300 million in 2015, is expected to grow at a rate of 6.2% over 2016-2023. The growth can be credited to its wide application in horizontal drilling as well as demand for better control of drilling solids. Xanthan gum market share in pharmaceutical sector is predicted to exceed USD 55 million by 2023, with expected gains of 5.2% over 2016-2023. The growth can be credited to its use as diluents & disintegrants in tablets as well as protective colloids in suspensions. North America xanthan gum market size worth USD 220 million in 2015, is predicted to register a CAGR of 5.3% over 2016-2023. Heavy expenditure on medicines along with expansion of pharmaceutical sector is expected to drive the product demand in the region. U.S. is expected to contribute significantly towards the regional growth over the coming years. Europe xanthan gum market is expected to surpass USD 235 million by 2023 owing to growing demand for personal care products along with rising R&D investments on pharmaceutical sector. Germany, UK, Italy, and France are projected to be the major revenue pockets of the region over the coming years. Asia Pacific xanthan market is anticipated to exceed USD 490 million by 2023. Expanding cosmetics and pharmaceutical sectors in the region due to growing product demand as well as low production cost is predicted to boost the regional growth. China and India are anticipated to be the major revenue contributors of the region over the coming years. Middle East & Africa market is expected to grow significantly over the coming years owing to increase in healthcare spending along with favorable government policies. Saudi Arabia is projected to contribute substantially towards the regional share. Market players will try to increase their ROI through merger & acquisitions and R&D investments. Key industry players include DuPont, Archer Daniels Midland, Fufeng Group Company Limited, Cargill, CP Kelco, Sancho & Lee, Jungbunzlauer, Qingdao Unichem, Deosen Biochemical Limited, Solvay S.A., and Pfizer Pharmaceutical Company. 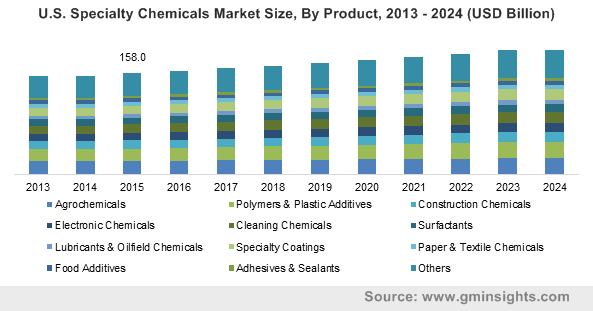 This entry was posted in Bulk & Specialty Chemicals and tagged Application Potential, Competitive Market Share & Forecast, Industry Analysis Report, Price Trends, Regional Outlook, Xanthan Gum Market Size By Application. Allantoin finds wide applications in cosmetics, oral hygiene, and pharmaceutical sectors. Allantoin application in cosmetics sector worth USD 135 million in 2015, is predicted to witness a substantial growth over 2016-2023. The high growth can be attributed to its increasing use in creams, shampoo, and lotions owing to its moisturizing features. In addition to this, growing demand for sunscreen lotions driven by the rising awareness among the people to protect their skin from UV rays and pollution is expected to boost global allantoin industry trends. Allantoin market share in pharmaceutical sector is anticipated to grow at a rate of 5.8 % over 2016-2023 owing to its wide use as an ingredient in modern ointments which help in treating skin ailments such as keratosis, psoriasis, xerosis, and eczema. 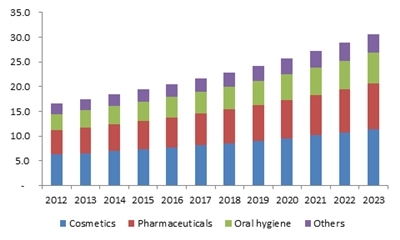 Furthermore, its applications in oral hygiene sector are expected to surpass USD 175 million by 2023 due to its use in oral wound healing products as a result of its superior cell proliferation characteristics. It also finds application in nutraceuticals and agrochemicals sectors owing to rising demand for food & beverages with high nourishing contents. Asia Pacific allantoin market worth USD 133 billion in 2015, is expected to produce a revenue of USD 220 million by 2023. The revenue growth can be credited to rise in population coupled with growing consumer purchasing capacity. China is expected to contribute substantially towards the regional share. North America allantoin market price is forecast to surpass USD 195 million by 2023 owing to growing applications of the products in pharmaceuticals, nutraceuticals, and oral hygiene sectors. U.S. is predicted to be the major contributor to the overall revenue share of the region. Europe market is predicted record a CAGR of 5.2% over 2016-2023 due to favorable regulations of European Commission supporting the use of allantoin in various industries. 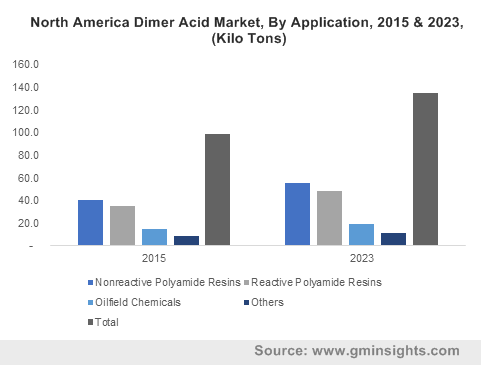 Latin America allantoin market is anticipated to witness a substantial growth over 2016-2023, owing to growth of cosmetics sector along with rise in consumer spending. Brazil is expected to be a major revenue pocket of the region. 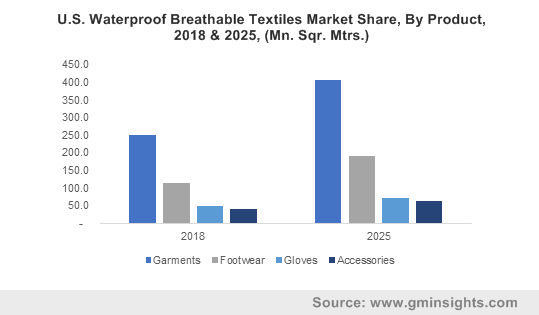 Geographical expansion, strategic alliances, and market penetration will be some of the key growth strategies adopted by the industry participants over the coming years. Key industry players include Ashland Inc., Rita Corporation, Akema Fine Chemicals, EMD Performance Materials, Clariant, LuBon Industry Company Limited, Luotian Guanghui Chemical Company Limited, Huanghua Suntime Chemical Industry Co. Ltd, and Zhanhua Jinyuan Lide Biotechnology. This entry was posted in Bulk & Specialty Chemicals and tagged Allantoin Market Size By Application, Application Potential, Competitive Market Share & Forecast, Price Trends. Rise in offshore oil & gas exploration activities across the globe is expected to fuel the demand for the FPSO (Floating Production, Storage, and Offloading) market over the coming years. Currently, the exploration activities are being carried out mainly in offshore oil & gas fields of Brazil, North Sea, and West Africa. Growing oil & gas requirements across the globe will boost investments in new oil & gas fields. The rapid expansion of upstream oil & gas industry coupled with favorable government policies to promote offshore oil & gas exploration activities is projected to boost the market size over the next few years. As per Global Market Insights Inc. report, the FPSO Market share worth USD 21 billion in 2015, is predicted to surpass USD 117 billion by 2024, growing at a CAGR of 19% over the period of 2016-2024. The U.S. FPSO market share worth USD 20 billion in 2015, is expected to witness a noticeable surge over the forecast timeframe owing to the growing production and exploration of natural gas, rise in offshore activities and the discovery of untapped reservoirs. The Norway market is anticipated to touch USD 3.1 billion mark by 2024. The China FPSO market size worth USD 687 million in 2015, is predicted to witness a significant growth, recording a CAGR of 22% over the period of 2016-2024. The growth can be attributed to the rise in offshore as well as onshore exploration coupled with production activities in the region. The Angola FPSO market share, growing at a CAGR of 26.4% over the period of 2016-2024, is estimated to reach over 11 units in 2024 in terms of volume. Factors such as growing offshore production and exploration activities carried out in Deepwater reservoirs are expected to contribute towards the regional growth. Firms like Eni, Exxon Mobil, and Chevron have offshore projects in Angola and adds about 1MMbbl/d to the capacity. In April 2016, about 260 floating production units were set up in offshore oil & gas fields of which FPSO accounted for approximately 64%. Conversion of tank vessels into FPSO units is predicted to support the industry growth over the next few years. For instance, 1995 built shuttle tanker converted to a Libra FPSO unit in 2015 was designed to achieve the production of crude oil. The converted FPSO market is predicted to record a CAGR of 18.9% over the period of 2016-2024 owing to low capital investments coupled with the ability to operate in small and medium fields. The redeployed FPSO market worth USD 719.8 million in 2015, is anticipated to witness a substantial growth, growing at a CAGR of 22.3% over the forecast period. The growth can be credited to the product’s ability to minimize the project execution time. 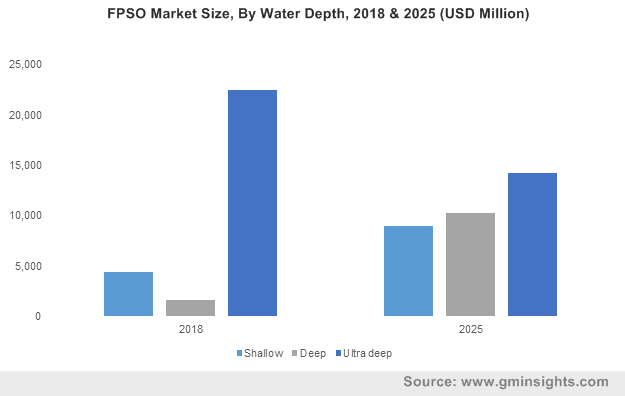 The new built FPSO market is predicted to witness a noticeable growth over the forecast timeframe due to growing ultra-deep water offshore exploration & production activities. 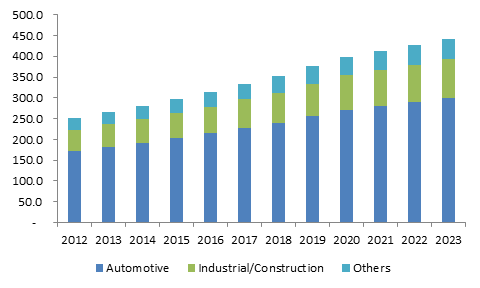 Key market players include SBM Offshore, MODEC Inc., BW Offshore, Samsung Heavy Industries, Aker Solutions, Hyundai Heavy Industries Co. Ltd., Teekay Corporation, Yinson Holdings Berhad, and Bluewater Energy Services B.V. These industry players will try to increase their market share through product innovation and mergers & acquisitions. This entry was posted in ENERGY, MINING, OIL AND GAS and tagged Application Potential, Competitive Market Share & Forecast, FPSO Market Size By Product, Industry Analysis Report, Price Trends, Regional Outlook.